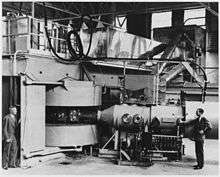 Although many false claims of its discovery were made over the years, the element was first synthesized by Edwin McMillan and Philip H. Abelson at the Berkeley Radiation Laboratory in 1940. Since then, most neptunium has been and still is produced by neutron irradiation of uranium in nuclear reactors. The vast majority is generated as a by-product in conventional nuclear power reactors. 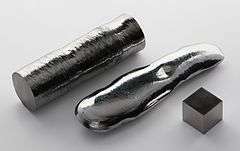 While neptunium itself has no commercial uses at present, it is widely used as a precursor for the formation of plutonium-238, used in radioisotope thermal generators to provide electricity for spacecraft. Neptunium has also been used in detectors of high-energy neutrons. A neptunium atom has 93 electrons, arranged in the configuration [Rn]5f46d17s2. This differs from the configuration expected by the Aufbau principle in that one electron is in the 6d subshell instead of being as expected in the 5f subshell. This is because of the similarity of the electron energies of the 5f, 6d, and 7s subshells. In forming compounds and ions, all the valence electrons may be lost, leaving behind an inert core of inner electrons with the electron configuration of the noble gas radon; more commonly, only some of the valence electrons will be lost. The electron configuration for the tripositive ion Np3+ is [Rn] 5f4, with the outermost 7s and 6d electrons lost first: this is exactly analogous to neptunium's lanthanide homolog promethium, and conforms to the trend set by the other actinides with their [Rn] 5fn electron configurations in the tripositive state. The first ionization potential of neptunium was measured to be at most (6.19 ± 0.12) eV in 1974, based on the assumption that the 7s electrons would ionize before 5f and 6d; more recent measurements have refined this to 6.2657 eV. 20 neptunium radioisotopes have been characterized with the most stable being 237Np with a half-life of 2.14 million years, 236Np with a half-life of 154,000 years, and 235Np with a half-life of 396.1 days. All of the remaining radioactive isotopes have half-lives that are less than 4.5 days, and the majority of these have half-lives that are less than 50 minutes. This element also has at least four meta states, with the most stable being 236mNp with a half-life of 22.5 hours. The isotopes of neptunium range in atomic weight from 225.0339 u (225Np) to 244.068 u (244Np). Most of the isotopes that are lighter than the most stable one, 237Np, decay primarily by electron capture although a sizable number, most notably 229Np and 230Np, also exhibit various levels of decay via alpha emission to become protactinium. 237Np itself, being the beta-stable isobar of mass number 237, decays almost exclusively by alpha emission into 233Pa. All of the known isotopes except one that are heavier than this decay exclusively via beta emission. The lone exception, 240mNp, exhibits a rare (>0.12%) decay by isomeric transition in addition to the beta emission. 237Np eventually decays to form bismuth-209 and thallium-205, unlike most other common heavy nuclei which decay into isotopes of lead. This decay chain is known as the neptunium series. When the first periodic table of the elements was published by Dmitri Mendeleev in the early 1870s, it showed a " — " in place after uranium similar to several other places for then-undiscovered elements. Other subsequent tables of known elements, including a 1913 publication of the known radioactive isotopes by Kasimir Fajans, also show an empty place after uranium. Several theoretical objections to the claims of Fermi's paper were quickly raised; in particular, the exact process that took place when an atom captured a neutron was not well understood at the time. This and Fermi's accidental discovery three months later that nuclear reactions could be induced by slow neutrons cast further doubt in the minds of many scientists, notably Aristid von Grosse and Ida Noddack, that the experiment was creating element 93. While von Grosse's claim that Fermi was actually producing protactinium was quickly tested and disproved, Noddack's proposal that the uranium had been shattered into two or more much smaller fragments was simply ignored by most because existing nuclear theory did not include a way for this to be possible. Fermi and his team maintained that they were in fact synthesizing a new element, but the issue remained unresolved for several years. Although the many different and unknown radioactive half-lives in the experiment's results showed that several nuclear reactions were occurring, Fermi's group could not prove that element 93 was being created unless they could isolate it chemically. They and many other scientists attempted to accomplish this, including Otto Hahn and Lise Meitner who were among the best radiochemists in the world at the time and supporters of Fermi's claim, but they all failed. Much later, it was determined that the main reason for this failure was because the predictions of element 93's chemical properties were based on a periodic table which lacked the actinide series. This arrangement placed protactinium below tantalum, uranium below tungsten, and further suggested that element 93, at that point referred to as eka-rhenium, should be similar to the group 7 elements, including manganese and rhenium. 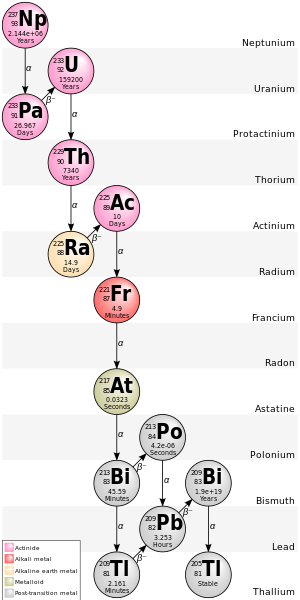 Thorium, protactinium, and uranium, with their dominant oxidation states of +4, +5, and +6 respectively, fooled scientists into thinking they belonged below hafnium, tantalum, and tungsten, rather than below the lanthanide series, which was at the time viewed as a fluke, and whose members all have dominant +3 states; neptunium, on the other hand, has a much weaker, more unstable +7 state, with +4 and +5 being the most stable. Upon finding that plutonium and the other transuranic elements also have dominant +3 and +4 states, along with the discovery of the f-block, the actinide series was firmly established. Although by 1938 some scientists, including Niels Bohr, were still reluctant to accept that Fermi had actually produced a new element, he was nevertheless awarded the Nobel Prize in Physics in November 1938 "for his demonstrations of the existence of new radioactive elements produced by neutron irradiation, and for his related discovery of nuclear reactions brought about by slow neutrons". A month later, the almost totally unexpected discovery of nuclear fission by Hahn, Meitner, and Otto Frisch put an end to the possibility that Fermi had discovered element 93 because most of the unknown half-lives that had been observed by Fermi's team were rapidly identified as fission products. This proved that the unknown radioactive source originated from the decay of uranium and, coupled with the previous observation that the source was different chemically from all known elements, proved beyond all doubt that a new element had been discovered. McMillan and Abelson published their results in a paper entitled Radioactive Element 93 in the Physical Review on May 27, 1940. 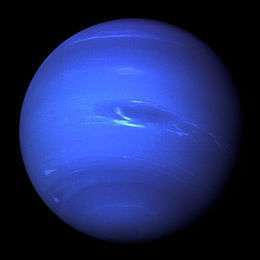 They did not propose a name for the element in the paper, but they soon decided on the name neptunium since Neptune is the next planet beyond Uranus in our solar system. Neptunium's unique radioactive characteristics allowed it to be traced as it moved through various compounds in chemical reactions, at first this was the only method available to prove that its chemistry was different from other elements. 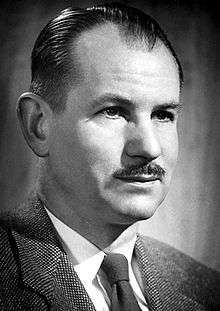 As the first isotope of neptunium to be discovered has such a short half-life, McMillan and Abelson were unable to prepare a sample that was large enough to perform chemical analysis of the new element using the technology that was then available. 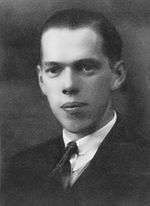 However, after the discovery of the long-lived 237Np isotope in 1942 by Glenn Seaborg and Arthur Wahl, forming weighable amounts of neptunium became a realistic endeavor. Early research into the element was somewhat limited because most of the nuclear physicists and chemists in the United States at the time were focused on the massive effort to research the properties of plutonium as part of the Manhattan Project. Research into the element did continue as a minor part of the project and the first bulk sample of neptunium was isolated in 1944. The vast majority of the neptunium that currently exists on Earth was produced in artificial nuclear reactions. Neptunium-237 is the most commonly synthesized isotope due to it being the only one that both can be created via neutron capture and also has a half-lifelong enough to allow weighable quantities to be easily isolated. As such, it is by far the most common isotope to be utilized in chemical studies of the element. When an 235U atom captures a neutron, it is converted to an excited state of 236U. About 81% of the excited 236U nuclei undergo fission, but the remainder decay to the ground state of 236U by emitting gamma radiation. Further neutron capture creates 237U which has a half-life of 7 days and thus quickly decays to 237Np through beta decay. During beta decay, the excited 237U emits an electron, while the atomic weak interaction converts a neutron to a proton, thus creating 237Np. n. It is a dark blue-purple and is analogous to its lighter congener, the pink rare earth ion Pm3+. In the presence of oxygen, it is quickly oxidized to Np(IV) unless strong reducing agents are also present. Nevertheless, it is the second-least easily hydrolyzed neptunium ion in water, forming the NpOH2+ ion. 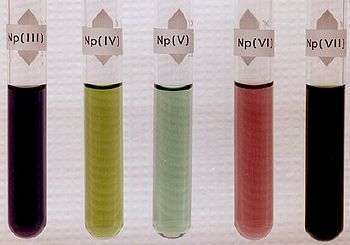 Np3+ is the predominant neptunium ion in solutions of pH 4–5. Three anhydrous neptunium oxides have been reported, NpO2, Np2O5, and Np5O8, though some studies have stated that only the first two of these exist, suggesting that claims of Np5O8 are actually the result of mistaken analysis of Np2O5. However, as the full extent of the reactions that occur between neptunium and oxygen has yet to be researched, it is not certain which of these claims is accurate. Although neptunium oxides have not been produced with neptunium in oxidations as high as those possible with the adjacent actinide uranium, neptunium oxides are more stable at lower oxidation levels. This behavior is illustrated by the fact that NpO2 can be produced by simply burning neptunium salts of oxyacids in air. A large number of additional alkali and alkaline neptunium oxide compounds such as Cs4Np5O17 and Cs2Np3O10 have been characterized with various production methods. Neptunium has also been observed to bond with oxides of many additional elements in groups 3 through 7, although these are much less well studied. NpF6 or neptunium hexafluoride is extremely volatile, as are its adjacent actinide compounds uranium hexafluoride (UF6) and plutonium hexafluoride (PuF6). This volatility has attracted a large amount of interest to the compound in an attempt to devise a simple method for extracting neptunium from spent nuclear power station fuel rods. NpF6 was first prepared in 1943 by reacting NpF3 and gaseous fluorine at very high temperatures and the first bulk quantities were obtained in 1958 by heating NpF4 and dripping pure fluorine on it in a specially prepared apparatus. Additional methods that have successfully produced neptunium hexafluoride include reacting BrF3 and BrF5 with NpF4 and by reacting several different neptunium oxide and fluoride compounds with anhydrous hydrogen ﬂuorides. Four neptunium oxyfluoride compounds, NpO2F, NpOF3, NpO2F2, and NpOF4; have been reported although none of them have been extensively studied. NpO2F2 is a pinkish solid and can be prepared by reacting NpO3 · H2O and Np2F5 with pure fluorine at around 330 °C. NpOF3 and NpOF4 can be produced by reacting neptunium oxides with anhydrous hydrogen ﬂuoride at various temperatures. Neptunium also forms a wide variety of fluoride compounds with various elements. Some of these that have been characterized include CsNpF6, Rb2NpF7, Na3NpF8, and K3NpO2F5. Two neptunium chlorides, NpCl3 and NpCl4, have been characterized and although several attempts to create NpCl5 have been made, they have not been successful. NpCl3 is created by reducing neptunium dioxide with hydrogen and carbon tetrachloride (CCl4) and NpCl4 by reacting a neptunium oxide with CCl4 at around 500 °C. Other neptunium chloride compounds have also been reported, including NpOCl2, Cs2NpCl6, Cs3NpO2Cl4, and Cs2NaNpCl6. Neptunium bromides NpBr3 and NpBr4 have also been created; the latter by reacting aluminium bromide with NpO2 at 350 °C and the former in an almost identical procedure but with zinc present. The neptunium iodide NpI3 has also been prepared by the same method as NpBr3. It is soluble in benzene and THF, and is less sensitive to oxygen and water than Pu(C5H5)3 and Am(C5H5)3. Other Np(IV) cyclopentadienyl compounds are known for many ligands: they have the general formula (C5H5)3NpL, where L represents a ligand. Neptunocene, Np(C8H8)2, was synthesized in 1970 by reacting neptunium(IV) chloride with K2(C8H8). 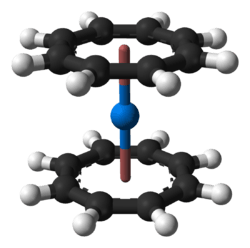 It is isomorphous to uranocene and plutonocene, and they behave chemically identically: all three compounds are insensitive to water or dilute bases but are sensitive to air, reacting quickly to form oxides, and are only slightly soluble in benzene and toluene. Other known neptunium cyclooctatetraenyl derivatives include Np(RC8H7)2 (R = ethanol, butanol) and KNp(C8H8)·2THF, which is isostructural to the corresponding plutonium compound. In addition, neptunium hydrocarbyls have been prepared, and solvated triiodide complexes of neptunium are a precursor to many organoneptunium and inorganic neptunium compounds. 1 2 Sanchez, Rene G.; Loaiza, David J.; Kimpland, Robert H.; Hayes, David K.; Cappiello, Charlene C.; Myers, William L.; Jaegers, Peter J.; Clement, Steven D.; Butterfield, Kenneth B. "Criticality of a 237Np Sphere" (PDF). Japanese Atomic Energy Agency. Retrieved 2014-08-06. 1 2 3 C. R. Hammond (2004). The Elements, in Handbook of Chemistry and Physics (81st ed.). CRC press. ISBN 0-8493-0485-7. ↑ Dabos, S.; Dufour, C.; Benedict, U.; Pagès, M. (1987). "Bulk modulus and P–V relationship up to 52 GPa of neptunium metal at room temperature". Journal of Magnetism and Magnetic Materials. 63–64: 661–3. Bibcode:1987JMMM...63..661D. doi:10.1016/0304-8853(87)90697-4. 1 2 Yu. D. Tretyakov, ed. (2007). Non-organic chemistry in three volumes. Chemistry of transition elements. 3. Moscow: Academy. ISBN 5-7695-2533-9. ↑ Lee, J; Mardon, P; Pearce, J; Hall, R (1959). "Some physical properties of neptunium metal II: A study of the allotropic transformations in neptunium". Journal of Physics and Chemistry of Solids. 11 (3–4): 177–181. Bibcode:1959JPCS...11..177L. doi:10.1016/0022-3697(59)90211-2. ↑ "Crystal Lattice Structures: The αNp (Ac) Structure". United States Naval Research Laboratory Center for Computational Materials Science. Retrieved 2013-10-16. ↑ Dunlap, BD; Brodsky, MB; Shenoy, GK; Kalvius, GM (1970). "Hyperfine interactions and anisotropic lattice vibrations of 237Np in α-Np metal". Physical Review B. 1 (1): 44–46. doi:10.1103/PhysRevB.1.44. 1 2 3 "Evaluation of nuclear criticality safety data and limits for actinides in transport" (PDF). Institut de Radioprotection et de Sûreté Nucléaire. p. 15. Retrieved 2010-12-20. ↑ Stephens, D. R. (1966). "Phase diagram and compressibility of neptunium". Journal of Physics. 27 (8): 1201–4. Bibcode:1966JPCS...27.1201S. doi:10.1016/0022-3697(66)90002-3. 1 2 3 4 5 6 7 8 9 10 11 12 "Periodic Table Of Elements: LANL - Neptunium". Los Alamos National Laboratory. Retrieved 2013-10-13. ↑ T D Matsuda; Y Hagal; D Aoki; H Sakai; et al. (2009). "Transport properties of neptunium superconductor NpPd5Al2". Journal of Physics: Conference Series. 150 (4): 1–4. Bibcode:2009JPhCS.150d2119M. doi:10.1088/1742-6596/150/4/042119. 1 2 V.A. Mikhailov, ed. (1971). Analytical chemistry of neptunium. Moscow: Nauka. ↑ Golub, A. M. (1971). Общая и неорганическая химия (General and Inorganic Chemistry). 2. pp. 222–7. ↑ C.M. Lederer; J.M. Hollander; I. Perlman (1968). Table of Isotopes (6th ed.). New York: John Wiley & Sons. 1 2 3 Weiss, Peter (2 July 2009). "Neptunium nukes? : Little-studied metal goes critical". Science News. 162 (17): 259. doi:10.2307/4014034. JSTOR 4014034. Retrieved 2013-10-19. ↑ Jukka Lehto & Xiaolin Hou (2011). "15.15: Neptunium". Chemistry and Analysis of Radionuclides (1st ed.). John Wiley & Sons. 231. ISBN 3527633022. 1 2 3 4 Thompson, Roy C. (1982). "Neptunium: The Neglected Actinide: A Review of the Biological and Environmental Literature". Radiation Research. Radiation Research Society. 90: 1–4. doi:10.2307/3575792. ↑ G. Audi; A. H. Wapstra; C. Thibault; J. Blachot & O. Bersillon (2003). "The NUBASE evaluation of nuclear and decay properties" (PDF). Nuclear Physics A. 729: 3–128. Bibcode:2003NuPhA.729....3A. doi:10.1016/j.nuclphysa.2003.11.001. ↑ Foster, R.F. (1963). Environmental behavior of chromium and neptunium in Radioecology. New York: Reinhold. pp. 569–576. ↑ "Human Health Fact Sheet - Neptunium" (PDF). Health Physics Society. 2001. Retrieved 2013-10-15. ↑ Fajans, Kasimir (1913). "Die radioaktiven Umwandlungen und das periodische System der Elemente (Radioactive Transformations and the Periodic Table of the Elements)". Berichte der deutschen chemischen Gesellschaft (German Chemical Society Reports). 46: 422–439. doi:10.1002/cber.19130460162. ↑ Fermi, E. (1934). "Possible Production of Elements of Atomic Number Higher than 92". Nature. 133 (3372): 898–899. Bibcode:1934Natur.133..898F. doi:10.1038/133898a0. ↑ Ida Noddack (1934). "Über das Element 93". Zeitschrift für Angewandte Chemie. 47 (37): 653–655. doi:10.1002/ange.19340473707. ↑ Koblic, Odolen (1934). "A New Radioactive Element beyond Uranium". Nature. 134 (3376): 55. Bibcode:1934Natur.134R..55.. doi:10.1038/134055b0. ↑ Speter, M. (1934). "Bohemium - An Obituary". Science. 80 (2086): 588–9. Bibcode:1934Sci....80..588S. doi:10.1126/science.80.2086.588-a. PMID 17798409. ↑ Fontani, Marco (2005). "The Twilight of the Naturally-Occurring Elements: Moldavium (Ml), Sequanium (Sq) and Dor (Do)". International Conference on the History of Chemistry. Lisbon. pp. 1–8. Archived from the original on 2006-02-24. Retrieved 2013-10-13. ↑ Hulubei, H.; Cauchois, Y. (1939). "Nouvelles recherches sur l'élément 93 naturel". Comptes rendus. 209: 476–479. ↑ Peppard, D. F.; Mason, G. W.; Gray, P. R.; Mech, J. F. (1952). "Occurrence of the (4n + 1) Series in Nature". Journal of the American Chemical Society. 74 (23): 6081–6084. doi:10.1021/ja01143a074. ↑ "The Nobel Prize in Physics 1938". Nobel Foundation. Retrieved 2013-10-13. ↑ Otto Hahn (1958). "Discovery of fission". Scientific American. ↑ Seaborg, G. T. (1994). "Ch. 118. Origin of the actinide concept". In K.A. Gschneidner, Jr.; L, Eyring; G.R. Choppin; G.H. Landet. Handbook on the Physics and Chemistry of Rare Earths. 18 – Lanthanides/Actinides: Chemistry. Elsevier. pp. 4–6, 10–14. ↑ Clark, David L.; Hecker, Siegfried S.; Jarvinen, Gordon D.; Neu, Mary P. (2006). "Neptunium". In Morss, Lester R.; Edelstein, Norman M.; Fuger, Jean. The Chemistry of the Actinide and Transactinide Elements (PDF). 3 (3rd ed.). Dordrecht, the Netherlands: Springer. p. 814. doi:10.1007/1-4020-3598-5_7. ↑ Glenn T. Seaborg. "The plutonium story". Lawrence Berkeley Laboratory, University of California. LBL-13492, DE82 004551. 1 2 3 Burney, G. A; Harbour, R. M; Subcommittee On Radiochemistry, National Research Council (U.S.); Technical Information Center, U.S. Atomic Energy Commission (1974). Radiochemistry of neptunium. ↑ Nilsson, Karen (1989). The migration chemistry of neptunium. ISBN 978-87-550-1535-7. ↑ "Separated Neptunium 237 and Americium" (PDF). Retrieved 2009-06-06. 1 2 Greenwood, Norman N.; Earnshaw, Alan (1997). Chemistry of the Elements (2nd ed.). Butterworth-Heinemann. p. 1265. ISBN 0-08-037941-9. ↑ Trygve E Eriksen; Pierre Ndalamba; Daqing Cui; Jordi Bruno; et al. (1993). "Solubility of the redox-sensitive radionuclides 99Tc and 237Np under reducing conditions in neutral to alkaline solutions." (PDF). SKB Technical Report. 93-18: 1–32. ↑ Neck, V.; Kim, J. I. & Kanellakopulos, B. (1992). "Solubility and hydrolysis behaviour of neptunium(V)". Radiochim. Acta. 56: 25–30. ↑ Kato, Y.; Kimura, T.; Yoshida, Z. & Nitani, N. (1996). 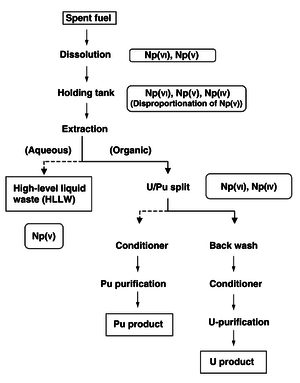 "Solid-Liquid Phase-Equilibria Of Np(VI) And Of U(VI) Under Controlled CO2 Partial Pressures". Radiochim. Acta. 74: 21–25. ↑ Nikonov, M.V. ; Bessonov, A.A.; Krot, N.N. ; Perminov, V.P. (1994). "Synthesis and characterization of Np(VI, VII) mixed-valence compound". Radiochemistry. 36: 237–8. ↑ Fahey, J. A.; Turcotte, R. P. & Chikalla, T. D. (1976). "Decomposition, stoichiometry and structure of neptunium oxides". Journal of Inorganic Nuclear Chemistry. 38: 495–500. doi:10.1016/0022-1902(76)80291-6. ↑ Sharma, B. K. Nuclear and Radiation Chemistry - Transuranium elements. Krishna Prakashan Media. pp. 128–9. ISBN 9788185842639. 1 2 Richter K; Sari C. (1987). "Phase relationships in the neptunium-oxygen system". Journal of Nuclear Materials. 148 (3): 266–71. Bibcode:1987JNuM..148..266R. doi:10.1016/0022-3115(87)90019-5. ↑ Benedict, U.; Dabos, S.; Dufour, C. & Spirelet, J. C. (1986). "Neptunium compounds under high pressure". Journal of Less Common Metals. 121: 461–68. doi:10.1016/0022-5088(86)90563-1. ↑ Fahey, J. A. (1986). "Neptunium". In Katz, J. J.; Seaborg, G. T.; Morss, L. R. The Chemistry of the Actinide Elements. 1. New York: Chapman & Hall. p. 456. ↑ Keller, C.; Kock, L. & Walter, K. H. (1965). "Die reaktion der oxide der transurane mit alkalioxiden—I: Ternäre oxide der sechswertigen transurane mit lithium und natrium". Journal of Inorganic Nuclear Chemistry. 27: 1205–23. doi:10.1016/0022-1902(65)80083-5. ↑ Carnall, W. T.; Neufeldt, S. J. & Walker, A. (1965). "Reactions in Molten Salt Solutions. I. Uranate and Neptunate Formation in Molten Lithium Nitrate-Sodium Nitrate". Inorganic Chemistry. 4 (12): 1808–13. doi:10.1021/ic50034a034. ↑ Morss, L. R.; Appelman, E. H.; Gerz, R. R. & Martin‐Rovet, D. (1994). "Structural studies of Li5ReO6, Li4NpO5 and Li5NpO6 by neutron and X-ray powder diffraction". Journal of Alloys and Compounds. 203: 289–95. doi:10.1016/0925-8388(94)90748-x. ↑ Keller, C. & Seiffert, H. (1969). "Li5NpO6, die erste kristalline verbindung mit siebenwertigem neptunium; zur frage der existenz von siebenwertigem plutonium und americium". Inorganic Nuclear Chemistry Letters. 5: 51–7. doi:10.1016/0020-1650(69)80236-9. ↑ Awasthi, S. K.; Martinot, L.; Fuger, J. & Duyckaerts, G. (1971). "Preparation and Characterisation of some Np(VII) Compounds". Inorganic Nuclear Chemistry Letters. 7: 145–51. doi:10.1016/0020-1650(71)80143-5. ↑ Mefod’eva, M. P.; Krot, N. N.; Smirnova, T. V. & Gel’man, A.D. (1969). "Oxalate Compounds of Hexavalent Neptunium". Radiokhimiya (in Russian). 11: 193–200. ↑ Hoekstra, H. R. & Gebert, E. (1977). "Some ternary oxides of neptunium and plutonium with the alkali metals". Journal of Inorganic Nuclear Chemistry. 39: 2219–21. doi:10.1016/0022-1902(77)80399-0. ↑ Tabuteau, A.; Pagès, M. (1985). "Neptunium". In Freeman, A. J.; Keller, C. Handbook on the Physics and Chemistry of the Actinides. 3. Amsterdam: North-Holland. pp. 184–241. ↑ Kleinschmidt, P. D.; Lau, K. H.; Hildenbrand, D. L. (1992). "Sublimation studies of NpF4". Journal of Chemical Physics. 97 (3): 1950–3. Bibcode:1992JChPh..97.1950K. doi:10.1063/1.463131. 1 2 Drobyshevskii, Y.V. ; Serik, V.F. ; Sokolov, V.B. ; Tul'skii, M.N. (1978). "Synthesis and some properties of neptunium oxide tetrafluoride and neptunium pentafluoride". Radiokhimiya (in Russian). 20: 238–243. ↑ Malm, J. G.; Weinstock, B.; Weaver, E. (1958). "The Preparation and Properties of NpF6; a Comparison with PuF6". Journal of Physical Chemistry. 62 (12): 1506–8. doi:10.1021/j150570a009. ↑ Fried, S. (1954). "Neptunium". In Seaborg, G. T.; Katz, J. J. The Actinide Elements. New York: McGraw-Hill. p. 471. ↑ Eller, P. G.; Asprey, L. B.; Kinkead, S. A.; Swanson, B. I.; et al. (1998). "Reaction of Dioxygen Difluoride with Neptunium Oxides and Fluorides". Journal of Alloys and Compounds. 269: 63–6. doi:10.1016/s0925-8388(98)00005-x. ↑ Kleinschmidt, P. D.; Lau, K. H. & Hildenbrand, D. L. (1992). "Sublimation studies of NpO2F2". Journal of Physical Chemistry. 97: 2417–21. doi:10.1063/1.463080. ↑ Peacock, R. D. & Edelstein, N. (1976). "Some reactions of neptunium hexafluoride". Journal of Inorganic Nuclear Chemistry. 38: 771–3. doi:10.1016/0022-1902(76)80353-3. ↑ Brown, D. (1972). "Transuranium". Gmelin Handbuck der Anorganischen Chemie, Suppl. Work. 4. Weinheim, Germany: Verlag Chemie. ↑ Fried, S. & Davidson, N. R. (1948). "The preparation of solid neptunium compounds". Journal of the American Chemical Society. 70 (11): 3539–47. doi:10.1021/ja01191a003. PMID 18102891. ↑ Zachariasen, W. H. (1949). "Crystal chemical studies of the tf-series of elements. X. Sulfides and ox\-sulfides". Acta Crystallographica. 2: 291–6. doi:10.1107/s0365110x49000758. ↑ Charvillat, J. P.; Benedict, U.; Damien, D.; Novion, D.; et al. (1976). "Neptunium". In Muller, W. & Linder, R. Tranplutonium Elements. Amsterdam: North-Holland. p. 79. ↑ Peacock, R. D. & Edelstein, N. (1997). "High pressure X-ray diffraction experiments on NpS and PuS up to 60 GPa". High Pressure Research. 15 (6): 387–92. Bibcode:1997HPR....15..387B. doi:10.1080/08957959708240482. 1 2 Thevenin, T.; Jove, J.; Pages, M. (1985). "Crystal chemistry and 237Np mossbauer investigations on neptunium oxide chalcogenides NpOS and NpOSe". Materials Research Bulletin. 20: 723–30. doi:10.1016/0025-5408(85)90151-5. ↑ Damien, D. & Berger, R. (1976). Spitsyn, V. I. & Katz, J. J., eds. Supplement to Journal of Inorganic Nuclear Chemistry - Moscow Symposium - On the Chemistry of Transuranium Elements. Oxford: Pergamon Press. pp. 109–16. ↑ Thevenin, T.; Pages, M. (1982). "Crystallographic and magnetic studies of a new neptunium selenide: Np2Se5". Journal of Less Common Metals. 84: 133–7. doi:10.1016/0022-5088(82)90138-2. ↑ Damien, D.; Wojakowski, A. (1975). "Preparation et parametres de maille des monoseleniures et monotellurures de neptunium et d'americium". Radiochemical and Radioanalytical Letters (in French). 23: 145–54. 1 2 3 Sheft, I. & Fried, S. (1953). "Neptunium Compounds". Journal of the American Chemical Society. 75: 1236–7. doi:10.1021/ja01101a067. ↑ Olson, W. M. & Mulford R. N. R. (1966). "The melting point and decomposition pressure of neptunium mononitride". Journal of Physical Chemistry. 70: 2932–2934. doi:10.1021/j100881a035. ↑ Blaise, A.; Damien, D. & Suski, W. (1981). "Electrical resistivity of neptunium mono and diarsenide". Solid State Communications. 37 (8): 659–62. Bibcode:1981SSCom..37..659B. doi:10.1016/0038-1098(81)90543-3. ↑ Dabos, S.; Dufour, C.; Benedict, U.; Spirlet, J. C.; et al. (1986). "High-pressure X-ray diffraction on neptunium compounds: Recent results for NpAs". Physica B. 144: 79–83. doi:10.1016/0378-4363(86)90296-2. ↑ Aldred, A. T.; Dunlap, B. D.; Harvey, A. R.; Lam, D. J.; et al. (1974). "Magnetic properties of the neptunium monopnictides". Physical Review B. 9 (9): 3766–78. Bibcode:1974PhRvB...9.3766A. doi:10.1103/PhysRevB.9.3766. ↑ Burlet, P.; Bourdarot, F.; Rossat‐ Mignod, J.; Sanchez, J. P.; et al. (1992). "Neutron diffraction study of the magnetic ordering in NpBi". Physica B. 180: 131–2. ↑ De Novion, C. H. & Lorenzelli, R. (1968). "Proprietes electroniques du monocarbure et du mononitrure de neptunium". Journal of Physics and Chemistry of Solids. 29 (10): 1901–5. Bibcode:1968JPCS...29.1901D. doi:10.1016/0022-3697(68)90174-1. ↑ Holley, C. E. Jr.; Rand, M. H. & Storms, E. K. (1984). The Chemical Thermodynamics of Actinide Elements and Compounds, part 6. The Actinide Carbides. Vienna: International Atomic Energy Agency. pp. 49–51. ↑ Lange, R; Carroll, W (2008). "Review of recent advances of radioisotope power systems". Energy Conversion and Management. 49 (3): 393–401. doi:10.1016/j.enconman.2007.10.028. 1 2 3 Yarris, Lynn (2005-11-29). "Getting the Neptunium out of Nuclear Waste". Berkeley laboratory, U.S. Department of Energy. Retrieved 2014-07-26. ↑ Dorin N Poenaru, Walter Greiner (1997). Experimental techniques in nuclear physics. Walter de Gruyter. p. 236. ISBN 3-11-014467-0. ↑ "Yucca Mountain" (PDF). Retrieved 2009-06-06. ↑ Rodriguez, C; Baxter, A.; McEachern, D.; Fikani, M.; et al. (2003). "Deep-Burn: making nuclear waste transmutation practical". Nuclear Engineering and Design. 222 (2–3): 299–317. doi:10.1016/S0029-5493(03)00034-7. ↑ J. I. Friese; E. C. Buck; B. K. McNamara; B. D. Hanson; et al. (2003-01-06). "Existing Evidence for the Fate of Neptunium in the Yucca Mountain Repository" (PDF). Pacific northwest national laboratory, U.S. Department of Energy. Retrieved 2014-07-26. Emsley, John (2011). Nature's Building Blocks: An A-Z Guide to the Elements. New York: Oxford University Press, USA. ISBN 0-199-60563-7. Hoffman, Klaus (2001). Otto Hahn: Achievement and Responsibility. Springer. ISBN 0-387-95057-5. Rhodes, Richard (2012). The Making of the Atomic Bomb (25th Anniversary ed.). New York: Simon & Schuster. ISBN 1-451-67761-8. Yoshida, Zenko; Johnson, Stephen G.; Kimura, Takaumi; Krsul, John R. (2006). "Neptunium". In Morss, Lester R.; Edelstein, Norman M.; Fuger, Jean. The Chemistry of the Actinide and Transactinide Elements (PDF). 3 (3rd ed.). Dordrecht, the Netherlands: Springer. pp. 699–812. doi:10.1007/1-4020-3598-5_6.